Firefight is Halo’s sandbox combat design distilled to its essence, and I haven’t been able to get enough of it from the day Reach shipped. I’ve spent more time in Firefight than in Campaign and Multiplayer combined (actually, you could double my Campaign and Multiplayer time, and Firefight still comes out ahead). So I was delighted to learn that Reach’s second map pack, the Defiant Map Pack from 343i and Certain Affinity, would include a new Firefight map, called Unearthed. I’ve had the opportunity to play the new maps for it for nearly a week now, and true to form I’ve spent nearly all of that time on Unearthed. Firefight’s shipping maps are a diverse lot, with eight maps spanning nearly every type of map suitable for the game type. Small symmetric, sprawling outdoors, night time, and everything in between. The one thing missing was a map honed for vehicular mayhem (Beachhead’s relatively small scale doesn’t quite get there). 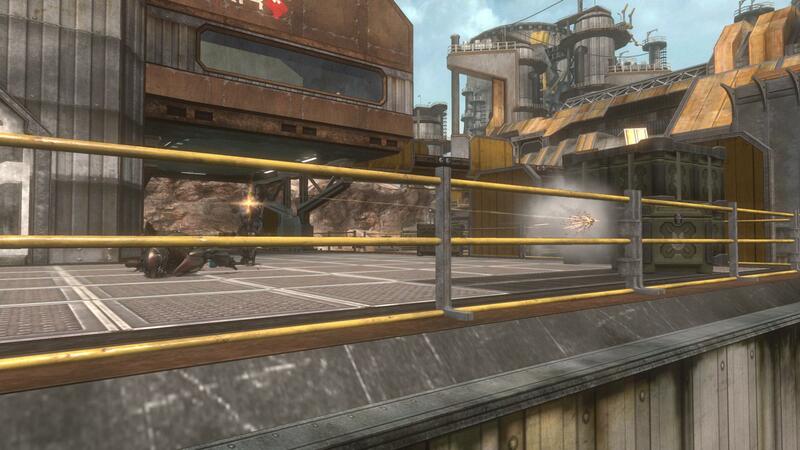 That slot has been filled with Unearthed, the lone Firefight map in the Defiant Map Pack, and it is hands-down the best Firefight map for vehicles in Reach. But in an added and unexpected bonus, it’s also the best map to play on foot. 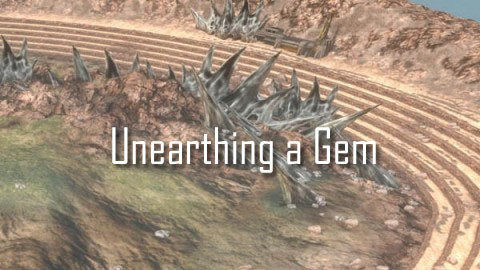 Unearthed is set on a titanium strip mine somewhere on Reach, which is really an excuse to have a large industrial base in the middle of a vast dirt race track. Granted, it’s a pretty good one, and with a gorgeous and vaguely alien skybox in tow. The map essentially breaks down to three large interconnected spaces: the industrial mining facility that comprises the base for infantry, and a large, open swath of terrain on either side of the base for vehicles to roam. The open land runs beneath the base, which forms a bridge between the inner and outer sections. 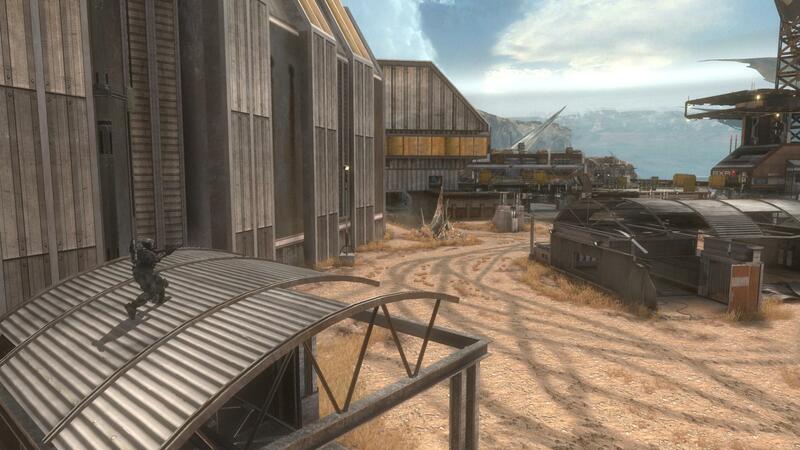 Right away, Unearthed feels different from other Firefight maps, and the reason is simple: it is the first Firefight map designed to be a Firefight map. 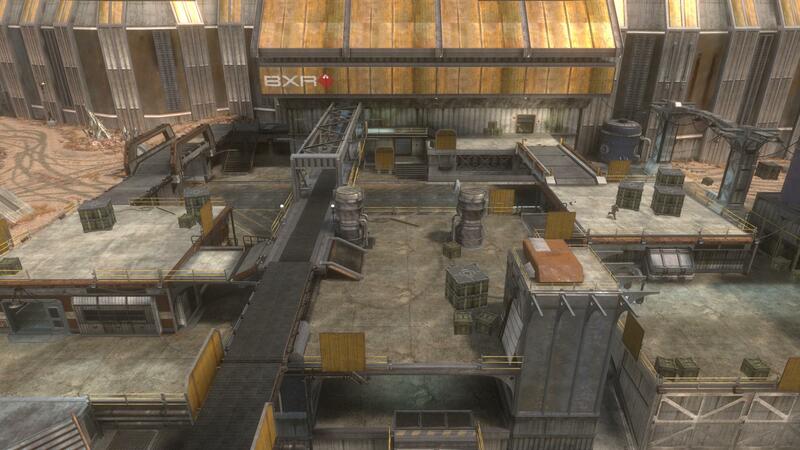 The maps that shipped with Reach were Campaign spaces carved out and retrofitted into Firefight maps. But none of them were designed from the ground up for the mode, and it shows. Reach’s shipping maps mostly share a couple of major flaws. 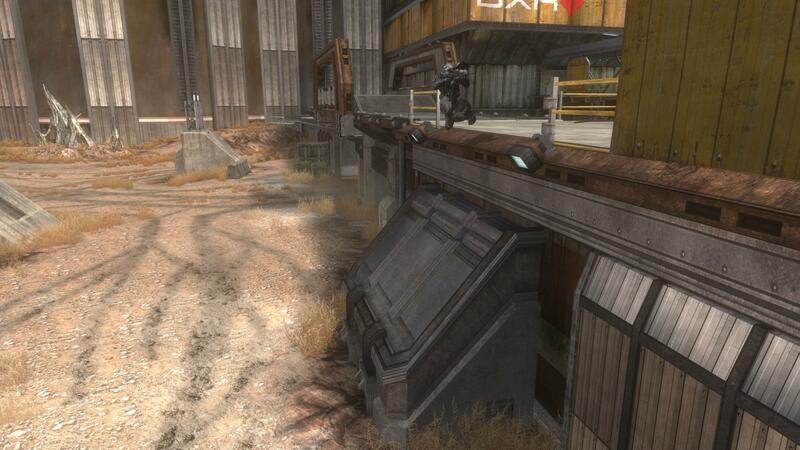 They feature safe rooms or high ground that make the maps far too easy to comfortably set up camp. There’s really no reason to roam beyond the platforms outside of Corvette and Courtyard’s spawn rooms, and even less to leave the roof of the central building on Outpost. (This does not make them bad maps – just less versatile.) The invading Covenant obediently file in small batches up one or two ramps or through one or two doors and get cut down in sequence. The maps range in size, but they generally feature action confined to a small space. On my first game of Score Attack on Unearthed, instinct and experience told me to fall back into the spawn room for safety and take out Covenant squads in sequence, especially since I did not know the map well. The room featured what I initially thought to be a fatal flaw: there are two entrances into it, but they both converge in the same corner. Ah-ha, I thought – that will make it too easy to defend. So I settled in and waited for enemies to file in. My first clue that this might not work out so well came when a Grunt tossed a plasma grenade from the room below through the window and almost stuck me, while I was already engaged with four other Grunts. I became a bit nervous when a Needle Rifle-toting Jackal took up camp on the walkway outside the window and pinged me relentlessly no matter where I was in the room. I started to panic when six Brutes walked in at the same time, and had to bail out that same window on multiple occasions. Because I’m a slow learner, it wasn’t until the Skirmisher wave, when a full dozen of the bastards flooded the room at once and violently murdered me that I grogged onto the fact that Certain Affinity set a trap. Admiral Ackbar would be proud. The spawn room looks safe, but it’s not: the Covenant on Unearthed come calling in droves if you take up residence there. It’s much better to sprint in, grab some ammo and a health pack and then sprint back out to the rest of the map if you want to survive. The folks at Certain Affinity built a large map, and they clearly wanted to make sure people used all of it. Consider the point taken. The outside of the base, which is comprised of the bridge and a set of connected platforms with a long, segmented set of (stationary) conveyor belt loading stations, are at once defensible but permeable. Playing both solo and with others, the area was often overrun. No more standing on top of the building and watching the one stair way, as on Outpost. The central platform on the base can be assaulted from no less than five directions at once, and that’s before the Skirmishers show up. And it will be, thanks to the unusually aggressive set of Covenant squads. Fortunately, those same numerous entry points mean that players always have places to move to – which I found myself doing often, because my team was never able to hold down territory for long. 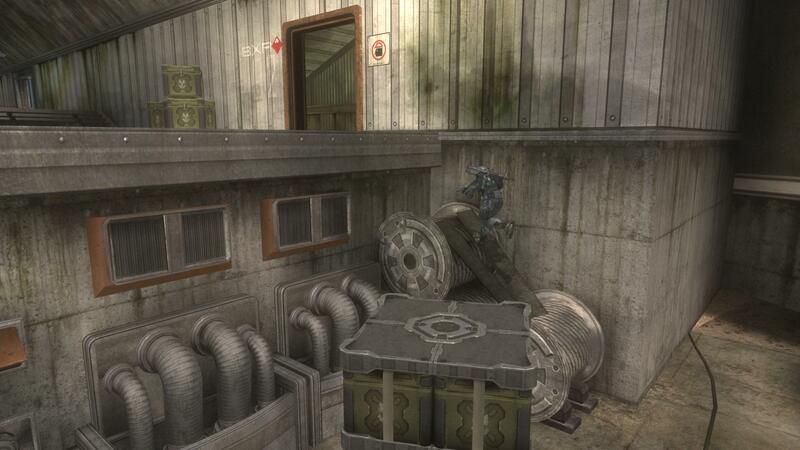 In addition to the main ramps and stair cases, the base is riddled with small jumps to link the upper levels of the base and the ground, so players dashing in from the open – probably from having their Warthog tossed – have a number of ways to fall back into cover or high ground quickly. They also help give the map a flow that make the different sections fit together much as a good Multiplayer map does. Similar to how the indoor and elevated sections of the base are balanced with a mix of advantages and danger, so too are the open areas. The track-riddled dirt expanses offer some marginal cover in the form of boulders, shifting elevation and some scattered shacks, but for the most part, they are quite open. On other maps, that would mean you could set up camp with a DMR and sniper rifle and be safe. And you would be, if enemies didn’t spawn out there in Score Attack, or get dropped off the drop ships in regular Firefight. It certainly would be safer if Wraiths didn’t have you dead to rights in the open, or the Jackal snipers that spawn on the surrounding cliff sides didn’t have an open shot at you. I’d feel a lot more comfortable if the five pack of Elite Ultras that like to drop in via their vertical shuttle didn’t rock me right out of my socks every time they showed up when I was out in the open. One detail to illustrate how the map is balanced: the cliffs are designed such that the Jackal snipers will only be able to hit players wandering out in the open; they can’t tag players at the center of the base. You get to pick your poison: try and hold down the base, or head into the open and deal with a whole new set of problems. Put simply, the outdoors is just as well balanced as the base. Which means you have both opportunity and danger across the entire map. 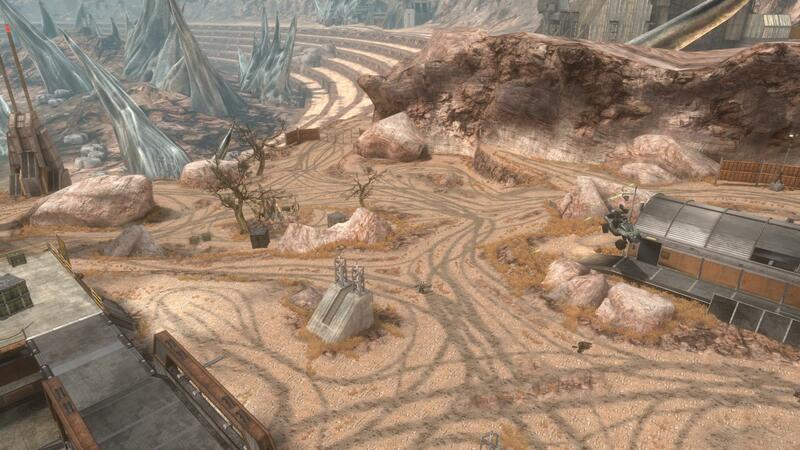 This is a dirt circuit meant to be blazed around, jumping, rolling, and plowing through Grunts. It’s large, well crafted and a lot of fun. The one caveat to my praise of the vehicles on Unearthed: it comes loaded with a Rocket Hog, not a regular Warthog. I strongly prefer the latter, as the Rocket Hog is all bark and no bite; a machine that generates lots of explosions and chaos, but is pretty inert against agile or armored opponents. But it does make things go boom real good, and I suspect that will be enough for most players. And on that count, it’s fun to use. In the end Unearthed is exactly what Firefight needed: a fantastic vehicle-heavy map that also doubles as a superb infantry map. And it plays better than anything Reach shipped with. There are a few rough edges that bear noting: this railing was modeled with an invisible barrier across most of it; the other such railings on the platforms do not have that issue. It’s a small problem, since that’s the sight line to a common drop ship location. It is similar to the problem CA’s Halo 2 maps had at launch. There is some severe slowdown when scoping from this corner of the map looking toward the base, which is odd since it’s clearly a space designed to be sniper perch. And there are several corners that Covenant get stuck on, as with other Firefight maps, leaving them comically jogging up against a small barb of geometry. 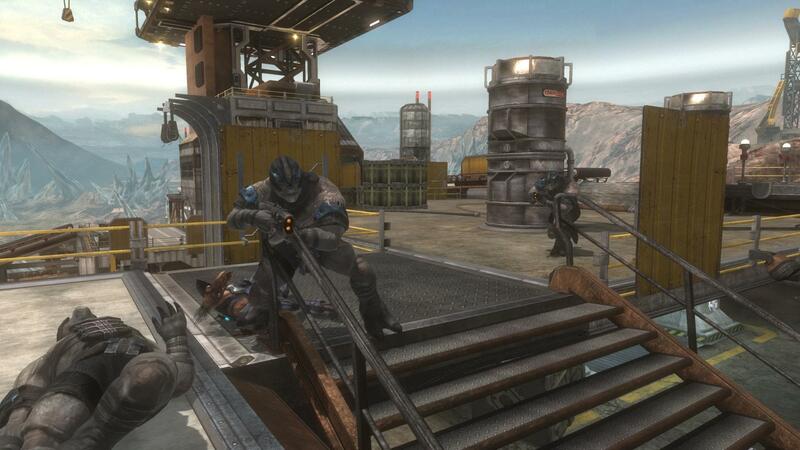 But those small warts aside, Certain Affinity and 343 Industries have produced the definitive Reach Firefight map. 343i’s Franchise Director Frank O’Connor has referred to it as the “first DLC Firefight map” for Reach, and given how it turned out, I sure hope it’s not the last. I couldn’t agree more. I’ve long said in forums and to friends that I’d pay any price they wanted to put on it if they’d just upload Lost Platoon from ODST and let me play FF2.0 on the definative FF map from the game that spawned it. They’ve done one better and built a map custom designed to my style of play; vehicular assaults. Buyed the map today. Gonnna try it tomorrow when I have more time. Nice review! You got me all hyped up! They need a map for air vehicular assault, like the campaign level in halo2 when you are trying to find the heratic leader. banshees banshees banshees! I simply desired to appreciate you once more. I’m not certain what I could possibly have done in the absence of those creative ideas shared by you directly on this question. It had become a real troublesome situation in my view, but finding out the very specialised technique you resolved the issue took me to jump with joy. I’m happier for your work and in addition sincerely hope you find out what a powerful job that you are getting into instructing the mediocre ones all through your web blog. I’m certain you have never come across any of us. article on twitter aand got a lot of good feedbacks.